The 1919 World Series matched the American League champion Chicago White Sox against the National League champion Cincinnati Reds. Although most World Series have been of the best-of-seven format, the 1919 World Series was a best-of-nine series (along with 1903, 1920, and 1921). Baseball decided to try the best-of-nine format partly to increase popularity of the sport and partly to generate more revenue. White Sox: Eddie Collins, Red Faber (did not play), Ray Schalk. The events of the series are often associated with the Black Sox Scandal, when several members of the Chicago franchise conspired with gamblers, allegedly led by Arnold Rothstein, to throw the World Series games. The 1919 World Series was the last World Series to take place without a Commissioner of Baseball in place. In 1920, the various franchise owners installed Kenesaw Mountain Landis as the first "Commissioner of Baseball." In August 1921, despite being acquitted from criminal charges, eight players from the White Sox were banned from organized baseball for fixing the series (or having knowledge about the fix). In 1917, the Sox won the World Series and, managed by William "Kid" Gleason, the 1919 Chicago White Sox had the best record in the American League. Team owner Charlie Comiskey had succeeded in building one of the most powerful teams in baseball. Most of the same players had defeated the New York Giants in the 1917 World Series, four games to two. They had fallen to sixth place in the American League in 1918, largely as a result of losing their best player, Shoeless Joe Jackson, and a few of his teammates as well, to World War I service. Comiskey fired manager Pants Rowland after the season, replacing him with Kid Gleason, who had played over twenty years in the majors but had never managed before. The 88–52 White Sox won the American League pennant again in 1919, by ​3 1⁄2 games over the Cleveland Indians (world champions the following year). Jackson was the unquestioned star of the team. The left fielder hit .351 that season, fourth in the league and in the AL's top five in slugging percentage, RBI, total bases and base hits. He was not the only star in a lineup with hardly a weak spot, as former A's superstar leadoff hitter Eddie Collins, one of the greatest second basemen of all time, was still going strong in his early thirties, hitting .319 with a .400 on-base percentage. Right fielder Nemo Leibold hit .302 with 81 runs scored. First baseman Chick Gandil hit .290, third baseman Buck Weaver .296, and center fielder Oscar "Hap" Felsch hit .275 and tied Jackson for the team lead in home runs with only 7 (as the dead-ball era was coming to a close). Even typical "good field, no hit" catcher Ray Schalk hit .282 that year, and shortstop Swede Risberg was not an automatic out with the .256 average and 38 RBI. Manager Gleason's bench contained two impressive hitters, outfielder Shano Collins and infielder Fred McMullin, both veterans of the 1917 world championship. The 1919 pennant-winning pitching staff was led by a pair of aces and a very promising rookie. Knuckleballer Eddie Cicotte had become one of the AL's best pitchers after turning 30 and discovering the "shine ball;" he had won 28 games for the 1917 champions, and after an off-year in 1918 had come back with a hefty 29–7, leading the league in wins and second in earned run average to Washington's veteran "Big Train" Walter Johnson. Next came Claude "Lefty" Williams, at 23–11 and 2.64. Twenty-six-year-old rookie Dickie Kerr started only 17 games, but turned in a solid 13–7 and 2.88. Fourth in the rotation was Urban "Red" Faber, who had beaten the Giants three times in the 1917 World Series but had an off-year in 1919 at 11–9 and 3.83 in 20 starts. He was ill and unable to pitch in the Series, limiting Gleason to three top-of-the-line starters for what could be nine games. However, all was not well in the White Sox camp. Tension between many of the players and owner Comiskey was quite high, given his penny-pinching ways memorialized in two urban legends: (1) that he told Gleason to shut down Cicotte in the last days of the regular season to prevent him from winning 30 games, a milestone which would have earned him a sizeable $10,000 bonus; (2) that many derided the White Sox as the Black Sox because Comiskey wouldn't pay to have their uniforms laundered regularly, and they became blacker and blacker due to accumulated sweat, grime, and dirt. 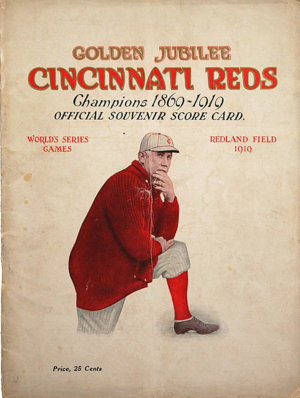 In contrast to the White Sox, the 1919 Cincinnati Reds were upstarts. They had finished no higher than third since 1900, and then only twice, before winning the NL pennant handily in 1919. Under new manager Pat Moran, best known as the leader of another bunch of unlikely newcomers to the World Series, the 1915 Philadelphia Phillies, the Reds finished nine games in front of the runner-up New York Giants at 96–44 and at least 20 games ahead of the other six, with the second highest NL won-lost percentage since 1910 at .686. Their greatest star was center fielder Edd Roush, who led the league in hitting at .321 and, like the White Sox's Jackson, was in the top five of their respective leagues in most important hitting categories. Third baseman Heinie Groh was the other great hitter on the team at .310 with a .392 on-base percentage and 79 runs scored. Slick-fielding first baseman Jake Daubert, a two-time National League batting champion with Brooklyn earlier in the decade, also scored 79 runs and hit .276, while catcher Ivey Wingo hit .273. The rest of the team was unheralded, including second baseman Morrie Rath, a .264 hitter with no power but a good on-base percentage, and shortstop Larry Kopf, a .270 singles hitter. The corner outfielders were decidedly weaker hitters, with former Phillies star left fielder Sherry Magee's .215 in 56 games and right fielder Earle "Greasy" Neale's .242 with little power. This would prompt Moran to start rookie Pat Duncan in left field in the World Series. The Reds' pitching was universally solid, however. The team's big three included Hod Eller (20–9, 2.39), Dutch Ruether (19–6, 1.82) and Slim Sallee (21–7, 2.06), all among the league leaders in various categories. They were backed by three other pitchers who were almost as successful: Jimmy Ring at only 10–9 but 2.26, Ray Fisher at 14–5 and 2.17 with five shutouts, and Cuban Dolf Luque at 10–3 and 2.63, former and future Giant who would win the last game of the 1933 World Series in long relief for New York. It was a deep and talented staff, a definite advantage in a Series whose format had just been changed from best of seven to best of nine. The conspirators got an unexpected assist when flu-stricken Faber was left off the World Series roster. Indeed, years later catcher Schalk said that had Faber been healthy, there never would have been a fix (since he almost certainly would have gotten starts that went to Cicotte and/or Williams). Despite their many wins on the field, the White Sox were an unhappy team. Many observers believe that it was Comiskey's stinginess that is largely to blame for the Black Sox scandal despite the fact that the 1919 White Sox payroll was third highest in the American League behind only Boston and New York. Stories of the "Black Sox" scandal have usually included Comiskey in its gallery of subsidiary villains, focusing in particular on his intentions regarding a clause in Cicotte's contract that would have paid Cicotte an additional $10,000 bonus for winning 30 games. According to Eliot Asinof's account of the events, Eight Men Out, Cicotte was "rested" for the season's final two weeks after reaching his 29th win presumably to deny him the bonus, but the truth may be more complex. Cicotte won his 29th game on September 19, had an ineffective start on September 24 and was pulled after a few innings in a tuneup on the season's final day, September 28 (three days before the Series opener). In addition, Cicotte reportedly agreed to the fix the same day he won his 29th game before he could have known of any efforts to deny him a chance to win his 30th. The story was probably true with regard to the 1917 season, however, when Cicotte won 28 games and hurled the White Sox to the world championship. The first game began at 3 pm at Cincinnati's Redland Field, with 30,511 fans in the stands and ticket scalpers outside the park raking in at least $50 per ticket. Chicago failed to score in the top of the first. In the bottom of the inning, Cicotte (who was paid his $10,000 the night before the series began) took the mound and hit the leadoff hitter, Morrie Rath, in the back with his second pitch, a prearranged signal to Arnold Rothstein that the fix was on. Even so, the game remained close for a while, due in part to some excellent defense from the conspirators, seeking to deflect suspicion from themselves. In the fourth, however, Cicotte "went haywire" (again according to Meany, op. cit. ), allowing a number of hits in succession climaxed by a two-out triple to the opposing pitcher, as the Reds scored five times to break a 1–1 tie. Cicotte was relieved at that point, but the damage was done and the Reds went on to add three more runs in later innings and triumph 9–1. Sportswriters thought that a bad throw by Cicotte to Risberg in the fourth inning, which prevented a possible double play, was suspicious. By that evening, there already were signs that things were going wrong. Only Cicotte, who had shrewdly demanded his $10,000 in advance, had been paid. "Sleepy" Bill Burns and Maharg met with Abe Attell, former world boxing champ and Rothstein's intermediary, but he withheld the next installment ($20,000) nonetheless to bet on the next game. The next morning Gandil met Attell and again demanded money, but again to no avail. Although they had not received their money, the players were still willing to go through with the fix. "Lefty" Williams, the starting pitcher in Game 2, was not going to be as obvious as Cicotte. After a shaky start, he pitched well until the fourth inning, when he walked three and gave up as many runs. After that he became virtually unhittable again, giving up only one more run; but lack of clutch-hitting, with Gandil a particularly guilty party, led to a 4–2 White Sox loss. Attell was still in no mood to pay up afterwards, but Burns managed to get hold of $10,000 and gave it to Gandil, who distributed it among the conspirators. The teams headed north to Comiskey Park in Chicago for Game 3 the next day, with no days off for travel in this Series. Rookie pitcher Dickie Kerr, the Game 3 starter for the Sox, was not in on the fix. The original plan was for the conspirators, who disliked Kerr, to lose this game; but by now dissent among the players meant that the plan was in disarray. Burns still had faith and gathered the last of his resources to bet on Cincinnati. It was a decision that would leave him broke, as Chicago scored early—Gandil himself driving in two runs—and Kerr was masterful, holding the Reds to three hits in a 3–0 complete game shutout. Cicotte, the Game 4 White Sox starter, was determined not to look as bad as he had in Game 1. For the first four innings, he and Reds pitcher Jimmy Ring matched zeroes. With one out in the fifth, Cicotte fielded a slow roller by Pat Duncan but threw wildly to first for a two-base error. The next man up, Larry Kopf, singled to left; Cicotte cut off the throw from Jackson and fumbled the ball, allowing Duncan to score. The home crowd was stunned by the veteran pitcher's obvious mistake. When he then gave up a double to Greasy Neale scoring Kopf to make it 2–0, that was enough of a lead for Ring, who threw a three-hit shutout of his own matching Kerr's in Game 3. The Reds led the Series 3–1. After the game "Sport" Sullivan came through with $20,000 for the players, which Gandil split equally among Risberg, Felsch, and Williams, who was due to start Game 5 the next day. Game 5 was postponed by rain for a day. Both starters, Williams and Cincinnati's Hod Eller, pitched excellently at first, with neither allowing a runner past first until the top of the sixth, when Eller himself hit a blooper that fell between Felsch and Jackson. Felsch's throw was off-line, sending Eller all the way to third. Leadoff hitter Morrie Rath hit a single over the drawn-in infield, scoring Eller. Heinie Groh walked before Edd Roush's double—the result of more doubtful defense from Felsch brought home two more runs, with Roush scoring shortly thereafter. Eller pitched well enough (he struck out nine batters, including a then-World Series record six in a row, since tied by Moe Drabowsky in the 1966 World Series opener) for the four runs to stand up, and the Reds were only one game away from their first world championship. The Series reverted to Cincinnati for Game 6. Dickie Kerr, starting for the White Sox, was less dominant than in Game 3. Aided and abetted by three errors, the Reds jumped out to a 4–0 lead before Chicago fought back, tying the game at 4–4 in the sixth, which remained the score into extra innings. In the top of the tenth, Gandil drove in Weaver to make it 5–4, and Kerr closed it out to record his—and Chicago's—second win. Despite the rumors already circulating about Cicotte's erratic performances in Games 1 and 4, White Sox manager Kid Gleason showed faith in his ace for Game 7. This time, the knuckleballer did not let him down. Chicago scored early and, for once, it was Cincinnati that committed errors. The Reds threatened only briefly in the sixth before losing 4–1, and suddenly the Series was relatively close again. This did not go unnoticed by Sullivan and Rothstein, who were suddenly worried. Before the Series started, the Sox had been strong favorites and few doubted they could win two games in a row—presuming that they were trying to win. Rothstein had been too smart to bet on individual games, but had a considerable sum riding on Cincinnati to win the Series. The night before Game 8, Williams—the scheduled starter—was supposedly visited by an associate of Sullivan's known as Harry F who left no doubt that if he failed to blow the game in the first inning, he and his wife would be in serious danger. Whatever Williams had been told made its impression. In the first, throwing nothing but mediocre fastballs, he gave up four straight one-out hits for three runs before Gleason relieved him with "Big" Bill James, who allowed one of Williams' baserunners to score. James continued ineffective and, although the Sox rallied in the eighth, the Reds came away with a 10–5 victory for a five-games-to-three Series win. Jackson hit the only homer of the Series, in the third inning after the Reds had built a 5–0 lead. Immediately after the Series ended, rumors were rife from coast to coast that the games had been thrown. Journalist Hugh Fullerton of the Chicago Herald and Examiner, disgusted by the display of ineptitude with which the White Sox had "thrown" the series, wrote that no World Series should ever be played again. Jackson led all players with his .375 average. Some believed that most of his offensive potency came in games that were not fixed and/or when the game seemed out of reach. He hit the Series' lone home run in the final (eighth) game, a solo shot in the third inning, by which time the Reds were already ahead by a score of 5–0. His five hits with runners in scoring position came in: Game 6, sixth inning with Kerr pitching; Game 7, first and third innings; Game 8, two in the four-run eighth. Shoeless Joe had 12 hits overall, a World Series record at that time. A Pathé Newsreel with a few minutes of footage of the series, including the suspicious Cicotte-Risberg throw, was found in Dawson City in 1978. In the book The Great Gatsby the character Meyer Wolfsheim is a reference to the actual Arnold Rothstein, who fixed the World Series of 1919. In the film The Godfather Part II, Hyman Roth states that he has liked baseball since Arnold Rothstein fixed the 1919 World Series. The eight banned players, most prominently Shoeless Joe Jackson, are principal characters in the novel Shoeless Joe, and its film adaptation, Field of Dreams. The film Eight Men Out, based on the book by Eliot Asinof, is about the fix itself. The television show Boardwalk Empire discusses the event in great detail. In Episode 6, Season 5 of Mad Men ("Far Away Places"), Roger Sterling imagines he is watching the 1919 World Series from his bathtub while on an LSD trip. In Episode 17, Season 2 of Friday the 13th: the Series, "The Mephisto Ring", the eponymous cursed artifact is a 1919 World Series ring that tells its owner the winners in any manner of gambling venue after it has killed the person wearing it. The history of the match and the teams involved is briefly touched on by a phone call the character Micki makes near the start of the episode to try and locate the ring. 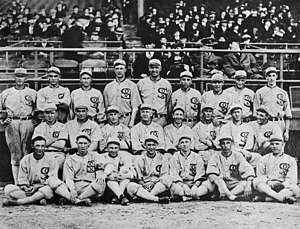 ^ "1919 Chicago White Sox". historicbaseball. Retrieved June 10, 2007. ^ "History Files - Chicago Black Sox". October 8, 2014. Archived from the original on October 8, 2014. Retrieved September 15, 2017. ^ James, Bill. The New Bill James Historical Baseball Abstract (2001). ^ Purdy, Dennis (2006). The Team-by-Team Encyclopedia of Major League Baseball. New York: Workman. ISBN 0-7611-3943-5. ^ a b Weschler, Lawrence (2016-09-14). "The Discovery, and Remarkable Recovery, of the King Tut's Tomb of Silent-Era Cinema". Vanity Fair. ^ Payne, Shaun. Hugh Fullerton and the Press’s Revealing Coverage of the Black Sox Scandal, 1919–1921. Historic Baseball. ^ Cohen, Richard M.; Neft, David S.; Deutsch, Jordan A.; Johnson, Roland T. (1976). World Series. Dial Press. ISBN 0-8037-9699-4. Asinof, Eliot (1963). Eight Men Out: The Black Sox and the 1919 World Series. New York: Henry Holt & Co. ISBN 0-8050-6537-7. Cohen, Richard M.; Neft, David S. (1990). The World Series: Complete Play-By-Play of Every Game, 1903–1989. New York: St. Martin's Press. pp. 76–81. ISBN 0-312-03960-3. Pietrusza, David (2003). Rothstein: The Life, Times, and Murder of the Criminal Genius Who Fixed the 1919 World Series. New York: Carroll & Graf. ISBN 0-7867-1250-3. Reichler, Joseph (1982). The Baseball Encyclopedia (5th ed.). Macmillan Publishing. p. 2127. ISBN 0-02-579010-2. History of the World Series - 1919 at The SportingNews. Archived from the original on 2008.